On December 26, American Toad #18-3152 was admitted to the Center from Albemarle County. The toad was observed in the road, bleeding and unable to hop; the rescuer initially thought she had been hit by a car. American Toad #18-3152 has been doing well and has gained weight; at her last weigh-in, she was 98 grams! Some of this weight gain is due to fluid retention. She’s given a daily bath in a hypertonic saline solution to minimize this fluid retention; the hypertonic solution has a higher amount of salt than the toad’s bodily fluids, causing the retained fluids to leave the toad’s body though its porous skin. The veterinary staff examines the toad weekly to assess her body condition and hydration level. Weekly checks will continue into early May, when the toad can be prepared for release. American Toad #18-3152 has been doing well at the Center; the toad has gained a whopping 31 grams and now weighs 69 grams! 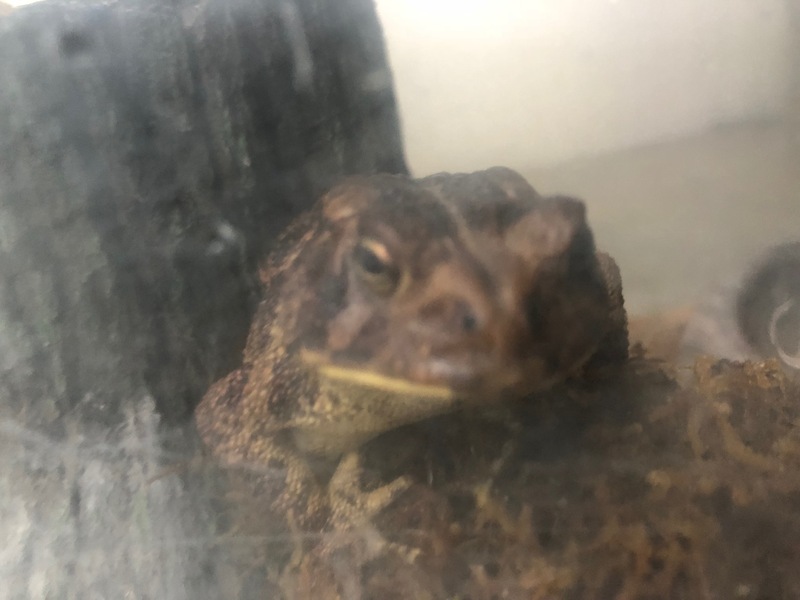 The toad is eating a diet of mealworms and crickets and is typically fed every day; the rehabilitation staff have been adjusting the amount of food to ensure the toad doesn’t gain too much while she continues to overwinter at the Wildlife Center. Each Thursday, the veterinary staff perform a quick health check; they are particularly careful to see if the toad is edematous [retaining too much fluid] – which can result from a fluid imbalance. In April 2018, the Wildlife Center began admitting this year's bear cubs from locations throughout Virginia. These bears were likely born between early January to mid-February of 2018. In most cases, the cubs were separated from their mothers or were orphaned. Bear cubs will be cared for by the Wildlife Center until next spring, at the time when they would begin naturally dispersing from their mothers. The 2018 cubs will be released in the spring of 2019. On Friday afternoon, the veterinary team was able to successfully capture and move the two Black Bear yearlings remaining in transition area #3 of the Black Bear Complex. Both bears had evaded their scheduled morning release after they managed to climb over the black protective plastic around one of the trees in the transition area and refused to come down. Yesterday’s releases of the seven bears went well; the bears were actually split into three groups and released a few miles apart from one another. Wildlife rehabilitators Brie and Kelsey were able to attend, and got some photos and videos! DGIF outreach people were also in attendance and will be sharing photos and videos at some point. Bear #18-2921 [Green/Orange Tags/“jaw bear”]. Final weight: 30.30 kg. Bear #18-3024 [Orange/Yellow Tags]. Final weight: 24.80 kg. The bears were examined, ear tagged for release, and weighed. After two more days of dedicated bear-trapping attempts, Brie was successfully able to lure all of the remaining yearlings into live traps by Wednesday afternoon! The bears were moved to Large Mammal Isolation in preparation for release. Bear #19-0057 [Double Green Tags]. Final weight: 19.9 kg. Bear #19-0097 [No Tags]. Final weight: 15.5 kg. On Monday, April 1, the bear releases started – though not as many bears departed today as the staff had planned. Last week, the rehabilitation team attempted to lure the bears out of the trees and into a live trap, so that they could be moved to the Large Mammal Isolation enclosure for easier darting, ear tagging, and loading for release. Unfortunately, none of the bears showed interest – so the team had to attempt to dart them today in yard #1. Bear releases are quickly approaching! All of the bear yearlings at the Wildlife Center are nearing their release time -- even the bears that were admitted within the past few months as undersized sick, injured yearlings. Not only are the bears old enough to be on their own at this point, but spring is also a good release time, due to the abundance of wild foods. Spring is approaching – and it’s almost time to say goodbye to the Black Bears of 2018! On January 17, the bear cubs celebrated their “Parturition Day”– there was a celebration for their collective birthdays! The 11 Black Bear cubs in yard #3 of the Center’s Black Bear Complex are all doing well. They’ve put on a good bit of weight this past fall; since we’re now in winter, the rehabilitation staff have cut back on the bears' food and are fasting the bears on Sunday. It’s more likely that the bears still have plenty of food to pick from on that particular day of the week, but by not offering fresh bags and buckets of food, the bears will stay at a healthier weight. On Thursday afternoon, November 15, the Wildlife Center lost power and suffered damage to fences and outbuildings during a severe ice storm. Portions of the Bear Complex were damaged, including a broken water line and several areas of fencing. In order to make repairs and secure the 11 Black Bear cubs in the complex, the rehabilitation team is planning to shift the cubs to Yard 3 – where adult Black Bear #18-2293 was housed. Wildlife rehabilitation intern Shannon reports that all of the cubs are doing well in the Bear Complex – they are exploring, climbing, and utilizing all of their one-acre space. Shannon says that the bears are fairly wary of their next-door neighbor, adult bear #18-1952. The Black Bear cubs of 2018 were successfully moved to the Bear Complex on Thursday, August 23! The 11 Black Bear cubs have been doing well in the Center’s Large Mammal Isolation enclosure; the cubs are eating well and growing quickly! The wildlife rehabilitation team will be happy to move the bears to the Bear Complex in two weeks. At this point, the plan is to allow the cubs to roam in yard #1 and yard #2 in the complex, which will give all 11 cubs access to a one-acre area. The 11 Black Bear cubs are doing well in the Center’s Large Mammal Isolation enclosure. The bears were fully weaned from their “mush bowls” this week, and are now eating a variety of fruits, vegetables, seeds, insects, and greens. Wildlife rehabilitator Brie said that none of the bears seemed to miss their mush bowls in the past two days, and the cubs are eating a lot more “adult foods” now, which means the Wildlife Center kitchen is going through a good bit of produce! The Black Bear cubs are doing well at the Center; they are all still receiving one mush bowl each, plus an ever-expanding “adult” diet of fruits, vegetables, seeds, and insects. All cubs have been weaned from their bottle feedings and soon will be weaned from their bear formula mush bowls entirely – wildlife rehabilitator Brie anticipates discontinuing mush for most of the cubs at the start of July, though the smallest cub, #18-1089 [Double Pink] may continue to receive a mush bowl while she’s housed separately. Last week, the cubs began Dr. Peach’s study on a new drug for treating mange in Black Bears. The cubs received the medication on Thursday and had blood draws on Friday; everything went smoothly. Dr. Peach had the opportunity to check each cub thoroughly during the blood draw process; she said all 10 cubs appeared to be in good condition. Some of the cubs still have some hair loss due to ringworm, but overall, they look good and no additional hair loss has developed. The next blood draw for the study will take place on Thursday, June 21. The 10 Black Bear cubs are doing well in the Center’s Large Mammal enclosure; they are sampling a variety of different foods that have been introduced to their diet – apples, pomegranates, other fruits, and greens. Each cub is also receiving a mush bowl daily, and Orange, Green, and Red tagged bears are also still bottle-feeding once a day, though as of June 11, Brie noted that they showed less interest. The eight black bear cubs in the Large Mammal Isolation enclosure are doing well and gaining weight. On Thursday, May 31, the rehabilitation staff weighed the cubs, most for the last time without sedation; they are now too big and strong to be handled and weighed while awake. The staff will continue to weigh Double Green tag until he reaches 5 kg. The Black Bear cubs are doing well in the Center’s Large Mammal Isolation enclosure; cub #8 will be joining them soon! Last week, the Center admitted another Black Bear cub, but since he only weighed 2.5 kg at admission, he has some weight to put on first before joining the others in the main enclosures. At today’s weigh-in, he was 2.7 kg – so should be able to come out of his Zinger crate in the next week. The Black Bear cubs are doing well since their move to the Large Mammal enclosure earlier this week. The former Green Tag was unhappy to be separated from her siblings as her ear healed, but fortunately on the evening of May 9, wildlife rehabilitator Brie examined it and thought it was healed enough to be introduced to the others. All seven cubs are housed together in one side of the Large Mammal enclosure; the rehab staff will get the other side ready in the next couple of days so that the cubs have more space to play! Watch them on Critter Cam 3. During the past week, the rehabilitation staff have been carefully monitoring the lesions on Pink Tag’s face; No Tag and (future) Red Tag also developed some small patches of hair loss. The staff took several hair samples and the Center’s diagnostic team started a DTM (dermatophyte test medium) to check for the ringworm fungus. On Monday, May 7, results came back positive for ringworm growth. The technicians were able to “type” the ringworm and concluded that the bears have a highly contagious form of the fungus. The seven bear cubs are doing well at the Center; the wildlife rehabilitation team looking forward to getting at least half of these rambunctious cubs into the Large Mammal enclosure area as soon as possible! Within the next week, a few door repairs should be complete, and the cubs that weigh more than 3.0 kgs will be able to move. Wildlife rehabilitator Brie reports that the bear cubs are enjoying their new space in the sheltered outdoor Metal Cage Complex. Most of the other small enclosures used for housing raptors have been cleared out of the space so that the bear cubs have plenty of room to run around during their play sessions. The rehabilitation team even constructed a fun jungle gym for the cubs, though Brie notes that the cubs are also happy trying to climb the walls and door! The five Black Bear cubs are doing well at the Center; they continue to eat three times a day and are increasingly energetic and playful with one another. Brie reports that cub #18-0383, the newest cub admitted, has been a little more lethargic than the other cubs; he may just be settling in and adjusting to his new siblings, but the cub will have blood drawn later this week for another analysis. On April 8, DGIF responded to several concerned calls about a Black Bear yearling in a townhouse complex in Albemarle County; although some residents were simply concerned about the bear's general presence in the neighborhood, others were worried that the bear was hurt or sick, because of visible hair loss and a possible limp. A DGIF biologist was able to tranquilize the bear and transport it to the Wildlife Center for assessment and care. Black Bear yearling #19-0328 has been doing well during the past week; every day, the vet staff monitor the bear’s respiratory efforts, and it appears as though the bear is breathing normally. The yearling is eating most, if not all, of his food every day. On October 14, a female Black Bear cub was found on the side of the road in Botetourt County, likely after being hit by a car. The cub was brought to a nearby wildlife rehabilitation center for stabilization before she could be transferred to the Wildlife Center the next morning. Black Bear #18-2926 has been doing well in the Center’s Black Bear Pen since the discovery of her tooth root abscess; the rehabilitation team have been feeding the bear a mostly soft diet, and have also gotten creative with a variety of edible “treats” that hide antibiotic pills. 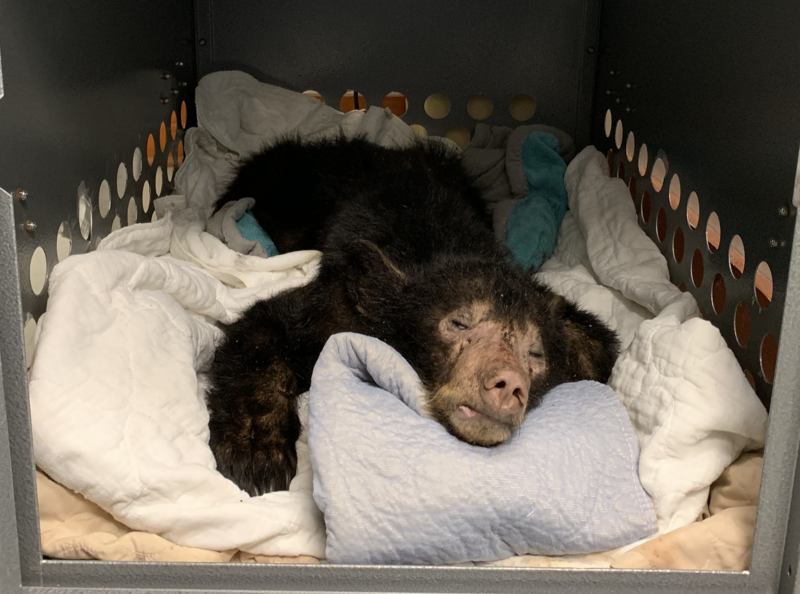 The Center is working with a local small-animal veterinary clinic to perform the surgery in late April or early May; this will allow the bear time to receive a full course of antibiotics prior to the procedure. On January 3, Black Bear #18-2926 [Pink/Orange Tags aka “elbow bear”] was darted and anesthetized for a follow-up examination and radiographs. The staff have been carefully observing the bear during the last few weeks; the bear will occasionally hold her old injured limb close to her body, but she does place the leg normally and has been seen climbing logs in the Large Mammal enclosure. 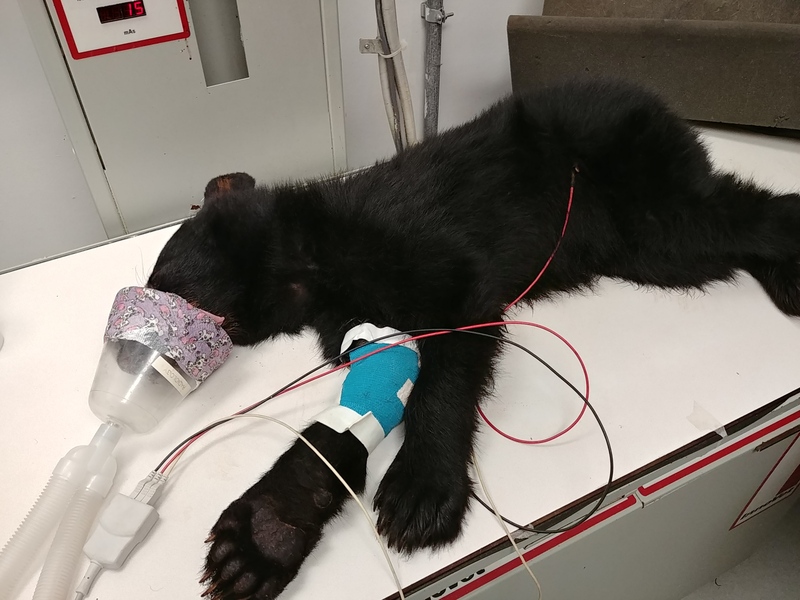 On Friday, November 30, Black Bear cub #18-2926 was anesthetized for radiographs to check on the healing progress of the bear’s fractured elbow. The cub has not been walking properly on his front limb, and based on observation, appeared to have a limited range of motion. On October 25, Black Bear cub #18-2926 was shifted from a zinger crate to the connecting chute in the Large Mammal Isolation enclosure. Rehabilitation staff report that the cub is eating well and able to move around the limited space, but she does not appear to be placing full weight on her recently-repaired right forelimb. The cub will remain in the connecting chute of the Large Mammal Isolation enclosure for another six to eight weeks while staff continue to monitor the bear’s progress. Black Bear cub #18-2926 recovered from Friday’s surgery well. The bear is eating well and getting to see and smell her neighbor, bear cub #18-2921. Cub #18-2926 will need to be cage-rested for eight weeks to fully allow her fracture to heal. At that point, the veterinary team will take radiographs to check on the bear’s elbow. She’s currently on a course of antibiotics to treat an open wound over the fracture. Dr. Karra and veterinary technician intern Jess took Black Bear cub #18-2926 to Virginia Veterinary Surgical Associates on the morning of October 19 for surgery. Dr. Padron was able to successfully stabilize the bear’s fractured elbow; he was pleased with the outcome and the bear recovered well from anesthesia. The bear will be placed in the small connecting chute between the two halves of the Large Mammal Isolation enclosure; this will give the bear limited space so that her elbow can heal in the coming weeks. On March 13, the Wildlife Center admitted hatchling Great Horned Owl #19-0148 from Chesterfield County. The owl was found by Chesterfield County Animal Control after the young bird fell from the nest and was then taken to a nearby veterinary hospital for initial assessment before being transferred to the Wildlife Center for continued care. Great Horned Owlet #19-0148 is eating on its own and gaining weight. The young owlet has gained 390 grams since admission, and now weighs a total of 1.10 kilograms. On the evening of February 1, a driver observed a Barred Owl hit the windshield of the car in front of her; the driver was able to capture and contain the owl and brought it to the Wildlife Center the next morning, where it was admitted as patient #19-0076. 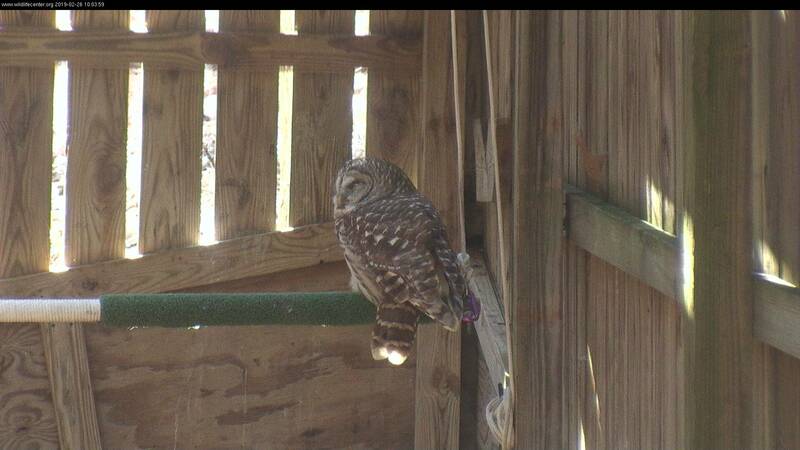 On April 7, Barred Owl #19-0076 was moved to Flight Pen 1. The following day, the owl had an ophthalmic examination with Dr. Karra, the Center’s veterinary intern; Dr. Karra reported that the owl’s retinal tear had healed, and the bird was cleared for exercise. Barred Owls #19-0022 and #19-0076 have been doing well for the past two weeks; while the owls generally don’t appear to perch close to one another, they are tolerating sharing the same space, and both owls are eating well. On March 26, the Wildlife Center admitted nestling Bald Eaglet #19-0207. The eaglet fell from a known eagle nest on a property in Campbell County and was caught by the property owner’s dog on March 24. The owners were familiar with the nest (located roughly 150 feet up in a tree) and knew the eaglet’s parents were active at the nest site this season. Re-nesting was not a simple option, and because of the long fall from the nest, the eaglet needed to be examined for injuries. Following repair of the fracture on March 27, Bald Eaglet #19-0207 was mostly eating well and tolerating physical therapy. At times, however, the bird was uninterested in eating and became stressed when its wing was extended for the physical therapy sessions. On March 11, a private citizen in Roanoke found an Eastern Ratsnake entangled in fishing net and took the snake to a local wildlife rehabilitation center for assessment. On March 14, the patient was transferred to the Wildlife Center for continued care . 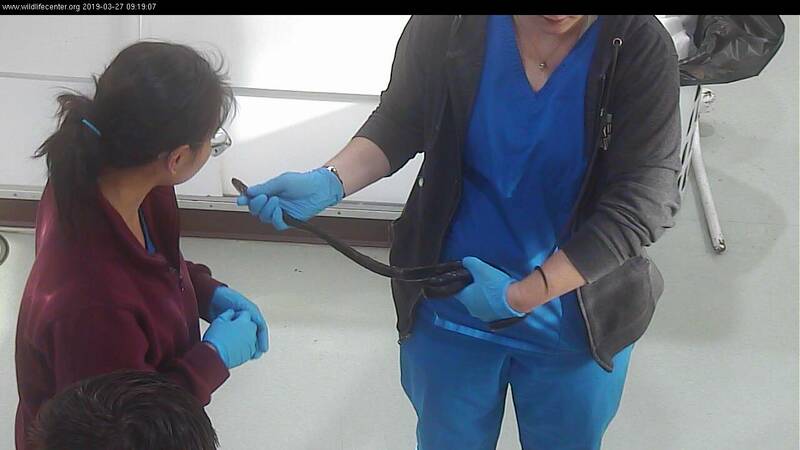 On April 5 the results came back from the swab taken from Eastern Ratsnake #19-0155. The snake tested positive for snake fungal disease (SFD). The veterinary team began treating the snake daily with antifungal medications and continued cleaning and checking all the wounds. On January 15, an adult female Bald Eagle was rescued by a Newport News Parks and Recreation ranger after the bird was hit by a car. After a veterinary clinic in Yorktown assessed and stabilized the eagle, a volunteer transported the bird to the Wildlife Center. In the weeks after moving to a larger flight pen, Bald Eagle #19-0031 did not show improvement during daily exercise. During some sessions, the bird would refuse to fly and would instead run along the ground. The rehabilitation team also identified a left-wing droop periodically when the bird was at rest. The veterinary team performed radiographs on March 25; the healed fracture of the left ulna showed significant callusing and signs of remodeling. These bony changes could be cause for discomfort for the eagle and could contribute to the birds inability and unwillingness to fly. On March 8, Bald Eagle #19-0031 was moved to a larger flight pen [A1] to begin flight conditioning. During the first few days of daily exercise, the eagle was not flying very high and it had a slight left wing droop while resting between passes; by the end of the week, the bird’s flight quality had improved slightly. If the eagle continues to improve, the rehabilitation staff will increase the number of passes the bird needs to make during exercise. Flight conditioning will take several weeks, and the eagle will need to reach optimal levels before the staff can consider release. Bald Eagle #19-0031 responded well to daily physical therapy sessions during the past two weeks and has been showing an increased range of motion in her left wing after nearly every session. By February 21, radiographs and a physical examination showed that the eagle’s fractured wing was stable enough for the veterinary team to remove the hardware supporting the fracture. Bald Eagle #19-0031 has made improvements during the three weeks following surgery. Although the bird was initially not eating well, her appetite has improved tremendously; the veterinary staff say she is now “ravenous” and readily eats the whole rat and fish that are offered to her each day. The bird’s fungal and yeast infections (likely caused by post-surgical antibiotics) have now cleared. Bald Eagle #19-0031’s surgical site has been healing well during the past ten days. Following surgery, the veterinary team gavage-fed the eagle to limit the stress put on the patient’s digestive tract; gavage-feeding involves inserting a tube down the bird’s throat and feeding a liquid diet. Bald Eagle #19-0031 has been doing well in the days following her surgery. The bird has been bright and alert, and Dr. Karra notes that the eagle is exceptionally strong. The veterinary team has been checking the surgical site on the eagle’s wing each day; the left ulna is swollen and bruised but is only showing a minor amount of discharge around the pin sites. The eagle is receiving laser therapy each day before her wing is re-bandaged and wrapped. On the afternoon of January 17, Drs. Ernesto and Peach took Bald Eagle #19-0031 to surgery to repair the eagle’s broken left wing and to remove the fish hook. Dr. Ernesto decided to try one more time to endoscopically remove the hook using a grasper attachment. He was able to grasp the hook, but felt a lot of resistance; it was difficult for the team to get a full understanding of what exactly the entire lure looked like. The team decided to open up the eagle’s abdomen and stomach and retrieve the hook that way. On January 2, Gray Treefrog #19-0004 was admitted to the Center – an unusual patient for this time of year. In December, homeowners in Augusta County were moving potted plants indoors and shortly after, they observed a frog hopping around their house. Treefrogs in Virginia enter brumation – a type of hibernation specific to amphibians and reptiles. The frog’s brumation was unintentionally interrupted, likely by being brought into the warm house. Eventually, the homeowners were able to capture the frog and bring it to the Center for assessment and care. Gray Treefrog #19-0004 has been doing well during the last two months; the veterinary staff performs weekly checks on the frog which include weighing and checking hydration. The frog‘s weight is down slightly from previous weeks [to 11.2 g], but it’s still in good body condition. Weekly checks will continue into early May, when the frog can be prepared for release. Gray Treefrog #19-0004 has been doing well at the Center this month; the frog is readily eating a diet of crickets and mealworms and has gained 3.48 grams since admission. The rehabilitation staff checks on the frog every day to ensure the frog has a clean enclosure and enough food. The veterinary team does a full health check every Thursday, just to ensure the frog remains healthy while it overwinters at the Center. On January 4, an adult Barred Owl was hit by a truck in Tazewell County, Virginia. The bird was taken to the Southwest Virginia Wildlife Center of Roanoke where it was stabilized before it was transferred to the Wildlife Center on January 10 and admitted as patient #19-0022. After recent repairs were made to a number of flight pens during the past week, a space opened up in the A1 flight enclosure. 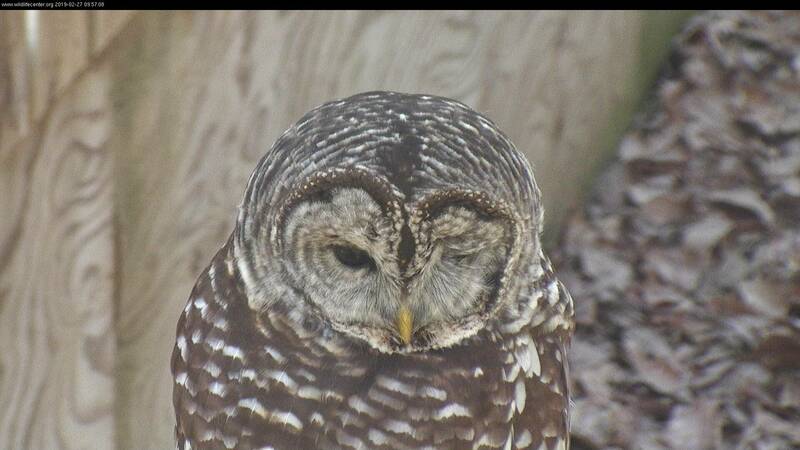 On March 26, the rehabilitation staff moved Barred Owl #19-0022 to A1 so that the bird could begin exercise. Due to the owl’s eye injuries, the bird has been placed on an “ocular hold” until April 15, which is three months after its admission date. By keeping the bird for three months and continuing to monitor the owl’s eye, the staff will be able to definitively know if the injuries are stable and resolved prior to release. On March 22, an adult beaver was found in a parking lot in Goochland County. The beaver was not moving, so someone called an animal control officer, who contained the beaver and took it to the Wellesley Animal Hospital. 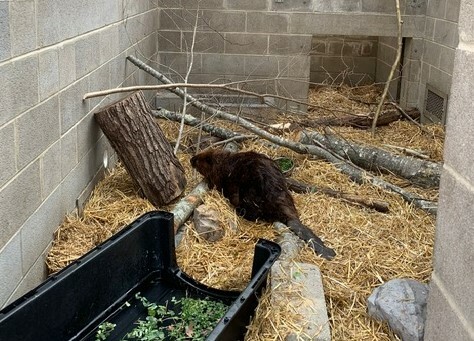 A veterinarian from Wellesley transported the beaver to the Wildlife Center later that afternoon. 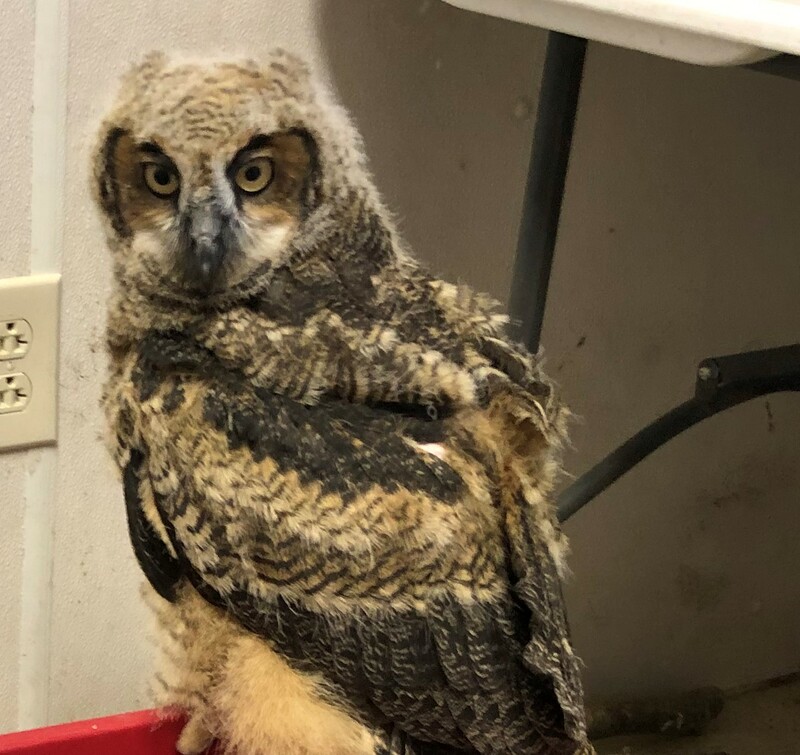 On March 10, a young Great Horned Owl was found in Virginia Beach and was taken to Nature's Nanny Wildlife Rehabilitation, a local permitted wildlife rehabilitation group. On March 29, the bird was transferred to the Wildlife Center so that the young bird could continue to grow up with an adult Great Horned Owl – surrogate Papa G’Ho.